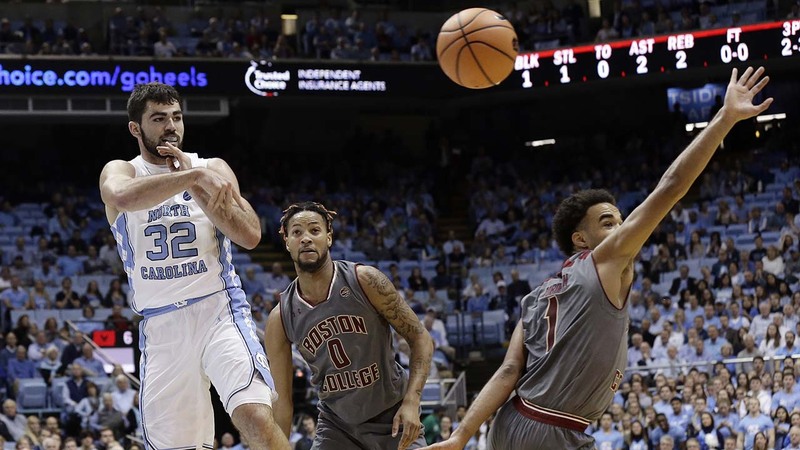 CHAPEL HILL, NC -- Powered by Luke Maye's monster performance, UNC Chapel Hill snapped a two-game losing streak Tuesday night with a 96-66 victory over Boston College. Maye scored 32 points and grabbed 18 rebounds before leaving to a deserved ovation with the outcome all but decided. Cameron Johnson added 14 points and 11 rebounds for the Tar Heels (13-4, 2-2 Atlantic Coast Conference), who were trying to avoid their first three-game losing streak since January 2014. UNC coach Roy Williams juggled his starting lineup to move in Johnson over freshman forward Garrison Brooks - and that wing-heavy unit responded by getting out in transition and on the attack in their active opening minutes. It was the Tar Heels' 11th consecutive victory over the Eagles. Maye became the first North Carolina player with at least 30 points and 15 rebounds at home since Antawn Jamison in 1997-98, according to ESPN Stats & Info. Joel Berry added 13 points for the Tar Heels, who led 50-35 at halftime and were never seriously threatened in the second half. UNC's Kenny Williams, left, battles for a loose ball with Raleigh Broughton grad Jerome Robinson of Boston College on Tuesday in Chapel Hill. UNC ran off an early 12-0 burst to go ahead for good, then relentlessly attacked the boards to address one of Williams' primary concerns with going small for long stretches. UNC had lost its previous two games, a close loss at Florida State followed by a one-sided loss to Virginia but never trailed after the Eagles College (11-6, 2-3) led 6-4 early. Boston College's dynamic duo with North Carolina roots - Jerome Robinson (from Raleigh) and Ky Bowman (from Havelock) combined for 36 points but only shot 14-of-31 from the floor collectively. Bowman made just 4 of 12 three-point attempts. Boston College: The Eagles have proven they're capable of big shooting days, most notably by making 15 of 26 3-pointers to hand then-No. 1 Duke its first loss in December. But they got off to a 2-for-13 shooting start, then struggled to grab a rebound in UNC's opening flurry. UNC grabbed 16 of the game's first 18 rebounds, putting BC in a quick hole that its periodic bouts of warmed-up shooting couldn't erase. UNC: The Tar Heels lost on the road to two ranked league opponents last week, most notably when they struggled to find any daylight against No. 3 Virginia's enveloping defense in a 61-49 loss. Things came much easier this time, with UNC doing a better job of spacing and getting out on the break early. And perhaps most importantly for Williams, UNC dominated the glass (58-23 advantage, 24 second-chance points) with Maye having a double-double by halftime and Johnson posting his second career double-double in his first start for UNC. Boston College: The Eagles step out of league play to host Dartmouth on Saturday. UNC: The Tar Heels visit Notre Dame on Saturday.